Major Pacific Storm Trump is a category six system on the Southern California Weather Force 1-6 scale. It will rain non-stop in many areas surrounding Ventura, Santa Barbara, and Los Angeles until later in the week. This is the ‘arc-storm’ pattern that will bring dangerous and deadly mudslides to the burn areas and in some cases non-burn areas in mudslide zones. Tornado Watch will continue to be needed mixed in with thunderstorm products so read on for details on what to expect. Furthermore I have issued a Thunderstorm Watch for the areas not within my tornado watch zone but does have the dynamics for thunderstorms to form in the following zones; Kern Valley … Western Inland Empire … San Diego County Coast/Valley … This divergence will overspread the area later this morning and into the afternoon. Instability profiles with the daytime heating will be enough to produce thunderstorms. Two separate areas in my thunderstorm watch box will have thunderstorm risks. 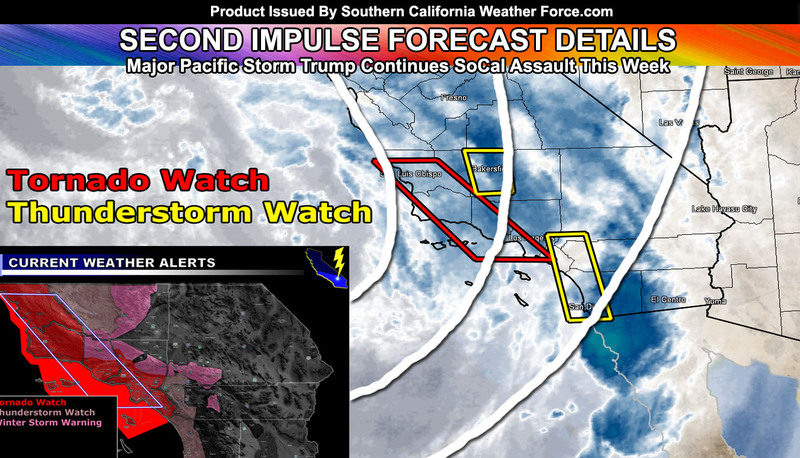 The most potent will be the line of storms that will form offshore OC/San Diego and move inland across the watch area. Gusty winds will accompany the front. This watch is to the east of the SCWF Tornado Watch, was is in effect through today. DESERTS: There is enough deep-layer moisture to bring rainfall to ALL desert locations of Southern California. No one should be left out of the precipitation due to the deep-layer moisture. The next impulse arrives on Tuesday, followed by yet another near Thursday. Both of the next impulses will target the Burn areas, however the most dangerous being the Ventura, Los Angeles, and Santa Barbara County zones on all accounts like my earlier forecasts said days ago. Those were always the most troublesome spots. We dry-out through the end week into the weekend but between January 21st and 23rd an inside slider moves in and this would drop the night-time temperatures once again for a brief period of time. No doubt freeze warnings and frost advisories will be needed then. As always.. stay tuned to Southern California Weather Force for updates. And if you are NOT a premium member.. you can get e-mail alerts for these articles and the micro-climate alerts when you sign-up today. Look below on how to do that. Please remember if upgrading to CANCEL YOUR PAYPAL PAYMENTS. Login and cancel the reoccurring payments. The Southern California Weather Force has different Facebook groups that you can ask for notifications from in order to get the latest posts affecting those regions. If that area is talked about in an article, alert, and such .. it’ll be posted there and you can be notified. Comments are usually DISABLED as we do like to keep this as an information giving group and replies from others in the notification may annoy some. EMAIL ALERTS? Many micro-climate zones to choose from to get custom alerts from thunderstorm, wind, flood, surf, heat, cold, storm, and much more with the premium e-mail alert system, the most advanced zone alert system in Southern California – Click Here To Join! VISIT THE MEMBER SECTION FOR 2018-2019 SEASON – SIGN-UP OR READ ABOUT IT HERE AND GET ADVANCE UPDATES DURING WEATHER EVENTS THROUGH THE ADVANCED EMAIL ALERT SYSTEM FOR MICRO-CLIMATE ALERTS ISSUED HERE!